Who would have thought in those days of Polaroids and slides, when a film roll came with 20 or 36 pictures, that we would be looking at photographs on a computer screen? I have two computer folders of old photographs my father had scanned in, some from slides and some from prints. Each folder has just over five hundred pictures, some ordered and labelled but most just anonymous. There are places and buildings and people and animals. Some are badly taken, poor focus or needy exposure, but some are absolute classics, and belong in the National Geographic. Sometimes I look at big thumbnails, other times I go through full screen slideshows. I recognise quite a few people, and can tell you who they are and how we are related, or what route the friendship took with my father. Some people remained steadfast friends to the end; some of the very old are still alive. Others came and went, blowing with the wind, changing direction when principles were cast in stone. The old photographs capture them quite prominently, while the real friends seem to be in the background. Real friends are always in the background, for that background is the fabric of our lives. There are photographs from Athens, Jerusalem, Alberton and Paris. There is a picture of the Eiffel Tower with its mast in the clouds. Except for Jerusalem all the places especially Alberton and the outskirts of Athens seem open, with ground for people to look over and let their eyes roam freely. That is no more, as the buildings have crept closer together and higher up. The roads were simple in those days, like rivers finding their way with the flow of people. Now they are channels, forcing us in a direction we may not want to go. There are pictures of christenings, simple lunches, picnics and sheep on the spit. There is a lot of dancing: in the garden, in the fields, in houses and in the kafeneio. There are many pictures with glasses and bottles raised in celebration, but no one seems drunk. They are all really happy to be together and free to live. The animals include some of our old pets, rabbits in Greece, donkeys in the village and stray dogs and cats around the old house. The animals are all skinny and generally unkempt, except the rabbits that were being fattened up for a stifado. I can imagine someone going through my photographs in fifty years time. 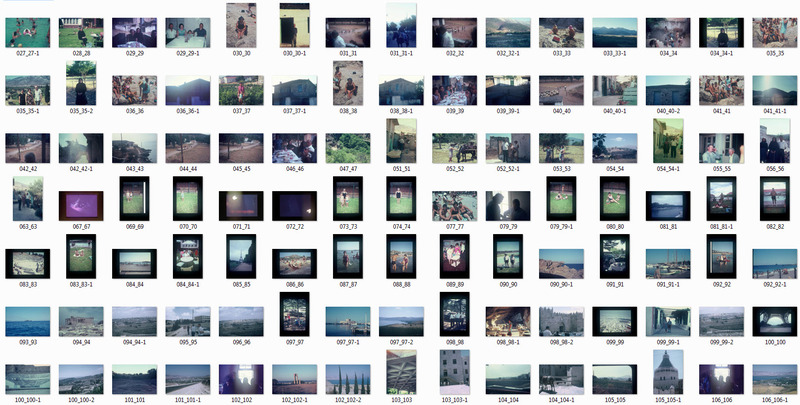 I have eighty eight thousand digital photographs at the moment. It would take that person a few months to go through those, and see the people and places that I have seen. There are some good photographs, but I am not sure if they tell as good a story as the old slides my father had digitised.